The Portuguese guitar descends from the western European Cithern. Once a very popular instrument with numerous models, during the 16th, 17th and 18th centuries, only a few models survived to the 19th century: the English guitar, from England and northern France; the Thuringian zither from Germany (Fig. 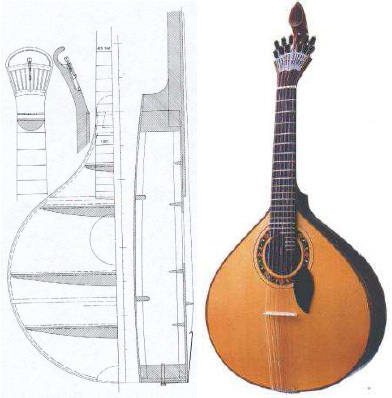 1); the Portuguese mandolin and the Portuguese guitar . Each instrument evolved in slightly different ways, changing the sizes and the number of strings. The curved pegbox was replaced by metal screw mechanisms for tuning, in some places a rosette was inserted in the sound hole, and the instruments are less decorated. The English guitar changed the tuning for a perfect chord scheme (CEG) while the Portuguese guitar remained faithful to the old cithern tuning. By 1796, Silva Leite wrote a method for the guitar called ”Estudo da Guitarra” for the usage of his students, being this the first time that the guitar is mentioned in Portugal , although the tuning used suggests that the method is written for the English guitar. Caldeira Cabral  argues that the tuning used today indicates that the Portuguese guitar descends directly from the cithern. The cithern used to be played as an erudite instrument in high society places, but entered in decadence by the 18th century, still resisting in the hands of some urban classes with economical power. By the middle of the century it was only played by beggars or in the taverns of the old neighborhoods. As Fado (Fig. 2) started to be a national song we assist to the rebirth of the instrument in Portugal in the middle of the 19th century, almost extinct in the rest of the Europe. Around 1870 the guitar is introduced in the academic student life of Coimbra, in which is still today, and gaining strength, an important component. The number of skilled players has rise constantly, namly Anthero da Veiga, Artur Paredes, Flávio Rodrigues, Carlos Paredes, Antonio Brojo and Antonio Portugal in the Combra’s style or Armando Freire, Jaime Santos, José Nunes, Raul Nery and Jorge Fontes in the Lisboa’s style. Recently the guitar captured the interest of erudite composers in Portugal and abroad, like Andrew Jackson (England), Yuasa (Japan) and Woody Man (USA). Also performers from different world locations are using it or its music: the Finnish musician Pekka Nylund, the jazz musician Charlie Haden, or the famous Kronos quartet are excellent examples. Like the Bouzouki in Greece and the Saz in Turkey, it is also a widespread instrument among the music groups in Portugal. - F. Jahnel, Manual of Guitar Technology. Frankfurt am Main: Verlag das Musikinstrument, 1981. - E. V. de Oliveira, Intrumentos Musicais Populares Portugueses. Bertrand, 3rd ed., 2001. - P. C. Cabral, Intrumentos Musicais Populares Portugueses, ch. Guitarra Portuguesa, pp. 194–199. The aim of this paper is to show an overview of the methods for analysis of string instruments' acoustical and mechanical properties. Some physically meaningful quantities such as the mechanical admittance of the bridge, sound radiated and modal analysis are discussed. The measurement of these quantities is not a straightforward process, all methods having their advantages and drawbacks. Problems concerning the holding of the instrument, the excitation process and excitation signals, and the recording of the response are shown. Finally we use the Portuguese guitar and the Turkish saz as case study. Was presented as part of the the seminar "MEASUREMENTS AND MODELING IN ACOUSTICS AND AUDIO" and published in technical report of the Helsinki University of Technology.